Up in the hills, Ubud is a gorgeous Balinese town a dozen or so miles north of the capital Denpasar. At first sight, Ubud seems like a sleepy provincial town, its streets lined with banyan trees, where tourists, street-vendors and Balinese women carrying heavy goods on their heads jostle for space on the narrow pavements. The town centre, however, reveals a plethora of temples, spas, museums and art galleries, cafes and restaurants to rival any Southeast Asian tourist destination. This charming town is tiny, and its development has been sympathetic. Surrounded by a stunning landscape of mountains, rivers and terraced rice paddies, it is a great spot for hikes, cycling and photography. It also has a wide variety of small hotels of all degrees of luxury, making it a fine base for a week or more in Bali. Uma by COMO is a 29 roomed hotel and spa set by the Barat river among the paddy fields and hills of Sanggingan, a village about 1 mile northwest of central Ubud. The hotel is part of the Singapore-based COMO group that includes The Halkin and Metropolitan hotels in London, as well as fashion brands DKNY Jeans and Armani Exchange. Unsurprisingly its properties also have a strong sense of style, presenting a sleekly modern and elegant design, while blending unobtrusively into the surrounding forested hillside. Each room has its own veranda and lawned garden overlooking the forest, where the ever-changing chorus of cicadas, birdsong and frog calls provide a mesmerising soundscape. Our room was one of the entry-level villas, but was nonetheless elegant. Being mainly in white, it had a large 4 poster bed draped with mosquito nets, distressed white woodwork and a semi open-air shower, a huge bath, and lovely Venetian mirrors, as well as standard mod cons. The resort has a fine infinity pool surrounded by trees, overlooked by the equally elegant bar and dining room. The hotel is about to be expanded to almost double the current number of rooms, with a new restaurant currently being built which will also be open to non-guests. It has an on-site spa, a yoga pavilion with classes twice a day, and a well-equipped gym. One of the most endearing features of the hotel was that each suite was a separate villa. They are scattered along various forested paths, each villa with its own wooden gate, leading into a small garden and porch, which gave a very private and intimate feel to the hotel. About 50 metres away from Uma by COMO, Mozaic is the fine-dining option in Bali, and has been included in the San Pelligrino Top 100 Restaurants of the World list. The restaurant is owned by Le Cordon Bleu graduate-chef, American Chris Salans who worked in Michelin-starred restaurants in Paris and the US, head-cheffing at some prestigious restaurants including Thomas Keller's. The restaurant's current head chef is a Frenchman, Xavier Mauerhofer whom I was lucky enough to meet. Xavier has had an impressive career too, having worked at some of London's best restaurants for a good ten years including The Square (one of my favourite London restaurants), No. 1 Lombard Street and Sketch, as well as restaurants in Shanghai, Singapore and Beijing. Mozaic offers 4 different tasting menus at various prices, all with an option of wine pairing at £37 or £57 per person for premium wines. We went for the Discovery Menu which uses primarily Balinese ingredients and is priced at £47 per person. Commendably, Mozaic offers an entirely vegetarian tasting menu at £40 per person for 6 courses, as well as the Chef's Tasting Menu at £60 that uses some top ingredients like foie gras, pata negra ham and truffles. There is also a Chef's Surprise Menu priced at £83, which tempted me, but I preferred to stay local and sample the Balinese menu. The wine list is very impressive too with a comprehensive range of new and old world options. Like anywhere else in Bali, the wines were highly priced with the list's entry level wines starting at £35. However, to be fair, these were expensive and good, unlike many other places which offer expensive poor wine. We ordered a Portuguese Tinta Roriz 2006 from the Douro Valley priced at £37 which was well balanced, with some long, soft tannins and good red berry fruit characteristics. The Discovery Menu is pictured below - the flavour combinations were sophisticated and exotic, I would struggle to describe them here, so I will leave you to savour the images that follow. We kicked off with a fine amuse bouche of Balinese king crab with dabu dabu spices, served with cucumber emulsion and parma ham powder that set off the evening to a good start. Kecicang - seared fresh water Sulawesi yabbies (an Australian crayfish), cauliflower, sesame, ginger flower gel and emulsion. Kluwek - coral trout confied in coconut oil, Balinese "Kluwek" (a nut from the Indonesian Kepayang tree, also widely used in Nyonya cooking in Malaysia) infused black olive sauce and olive oil braised vegetables. The flavour imparted by the coconut oil confit was delicate but surprisingly distinct, it was a delightful and interesting way to confit fish. Bumbu Rendang - rendang spiced oxtail tortellini with curry sweet potato, cep mushroom and parmesan emulsion. This was my favourite dish of the menu, the rendang of oxtail tortellini was rich and delicious. Nangka - Kintamani suckling pig, young jackfruit emulsion, bok choy, ginger and curry leaf infused demi glace. Sirsak - fresh soursop sorbet (Brazilian graviola fruit), grapefruit gelée, campari emulsion and pomelo tuile. Kunir and Kemangi - lemon basil mousse with turmeric root sorbet and fresh pomegranate. The food at Mozaic was highly sophisticated and beautifully flavoured. The Discovery Menu was indeed a journey of discovery into Balinese ingredients and flavours employed meticulously well by some classic French techniques. We were also offered a tray showing the primary Balinese ingredient of each of the courses were about to eat, which was a nice touch and informative. I highly recommend a visit to Mozaic when visiting Ubud - at £47 for a six-course tasting menu, this is excellent value for food of this calibre. At Uma by COMO, Kemira is the restaurant where breakfast, lunch and dinner is currently being served. Australian Heidi Flanagan, a former London resident, is the Head Chef for both COMO properties in Ubud. We were fortunate to meet her there, and have a fantastic lunch cooked by Heidi herself. Lunch began with a glass of Balinese sparkling wine from Hatten, a wine producer based in northern Bali, made from Chasselas Loulou and Alphonse Lavalée grapes (£6), which was surprisingly drinkable. Alcoholic beverages in Bali are taxed at around 400%, so they are very much a luxury item on the island. We then had a very zingy and refreshing salad of grilled prawn, pomelo, palm heart & young coconut with a red chilli and lime dressing (£7.30) which was sensational, along with a Balinese spiced grilled flaked tuna, long bean & green papaya salad with shallot sambal, chilli & lime (£8.30) that was equally good. For the main course, we had Nasi Campur, a local dish with a mixture of different meat, fish and rice elements including fish sate, beef curry, spiced grilled chicken, crispy fish, prawn & corn cake, long bean & coconut salad (£8), and Beef Rendang - spiced braised beef, tamarind & coconut curry (£11.70). Both salads and main courses were delicious, well seasoned and vibrant, and I enjoyed every single dish. 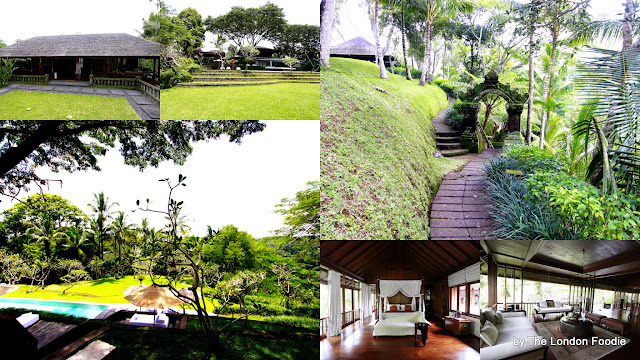 A 15 minute drive from central Ubud by the Ayung River, COMO Shambala Estate is Uma's sister property. The estate is the flagship resort of the COMO Group, with the Shambala brand reflecting the owners' ethos of a 'wellness' lifestyle. Shambala offers western and Balinese organic dishes as well as raw and vegetarian diets. It is a retreat for the weary wealthy, with 300 staff for 30 rooms, or about 10 staff per villa. We had a tour of their Royal suite which caters for heads of state and the occasional pop or movie star whom the manager would not name, in $3,200 per night splendour, or $4,300 for 2 nights as part of a package. It was utterly magnificent. Lunch at Glow Restaurant was excellent, prepared in an open-plan kitchen in front of us by executive chef Heidi Flanagan. We started with a lovely salad of "tuna sambal matah" - spiced tuna, grilled and flaked, and served with apple aubergines, ginger, shallot and lemongrass (£15). The Lawar Paku was another salad of minced chicken, coconut and turmeric served with fern tip, long beans and sprouts (£11), which was also delicious. We also had a refreshing and flavoursome dish of poached chicken, mango and cucumber salad with fresh young coconut, green chilli and coriander chutney (£13.50). The main courses were outstanding - full of herbs, well flavoured and zingy with interesting flavour profiles that were well integrated. I am not one to order salmon normally, but the grilled salmon with sumac & fennel crumbs was a highlight. It was served with a cauliflower, tomato & cucumber salad with quinoa & smoky aubergine puree (£16), which was a full meal in itself and was utterly delicious. The cumin crusted lamb loin with roast barley, celery & walnut salad was also good, served with a tahini sauce (£21). The Mee Goreng - fresh egg noodles with seafood, vegetables, sambal & egg (£13) was very well made and beautifully presented. For dessert, we had Es Bunga Chempaka - chapaka flower-scented ice with palm seeds, sago pearls and fresh soy milk (£8), and poached exotic fruits with spiced nut crumble and vanilla, cashew nut ice cream (£8). We also had Shambala's version of the classic banana split. The food at Shambala Estate was at London prices which were about 5 times what you would have normally paid anywhere else in Bali. The quality and flavours were however outstanding and worth every penny in my opinion. I would highly recommend a meal at one of these two properties during any stay in Ubud (the menu at Shambala Estate is more comprehensive than at Uma's). Uma by COMO offers free yoga classes for one hour each morning and afternoon, as well as a free hour-long pre-breakfast guided walk through the local rice paddies. Uma by COMO can also arrange a driver and guide for escorted trips to the local markets, temples, volcanos and rivers. 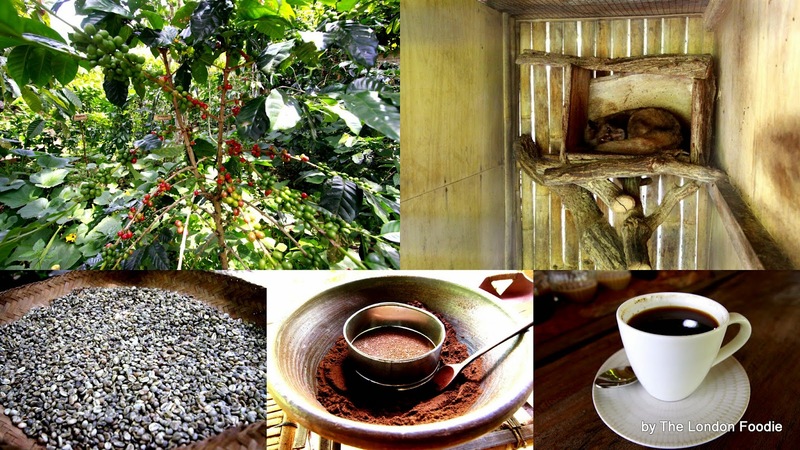 We took a three hour guided tour and downhill bike ride, which started with a visit to a local farm (Bali Pulina Agrotourism) to see and taste Indonesia's famous Kopi Luwak (civet-coffee), which is produced in Bali, Java and Sumatra. Some brave individual noted in the 19th century that coffee berries eaten and defaecated by Asian palm civets could be washed and roasted to make drinkable coffee. First discovered by Indonesian plantation workers, the drink was rapidly taken up by their Dutch colonial masters and became popular most probably because of the novelty of the production method rather than the superior taste of the drink. In any case, today luwak is the most expensive coffee in the world, selling at around £300 per kilogram. In blind tastings by professionals, it has not fared well, but devotees believe the enzymatic digestion within the intestine of the civet alter the amino acid structure to make the drink richer and smoother. There are, however, concerns about the welfare implications for the civets whose droppings are so precious that they are kept in cages and fed an unnatural diet exclusively of coffee berries (see an interesting article about this here). At the end of our tour of the farm, we had a cup of the fabled drink for around £3.50 alongside a regular Balinese coffee, and could not but conclude that the civet's digestive processes stripped the drink of much of its aroma and flavour. After this, we paid a visit to the 10th century Tirta Empul temple (£4 entry). The temple was founded next to an underground spring, and pilgrims come daily to bathe in its fountains. After passing through the temple, the spring is used to irrigate the rice paddies for miles around. Our trip ended with a downhill cycle through many small villages and miles of paddy fields with volcanic mountains on the horizon, and scores of children smiling and calling 'hello' as we passed them. This museum is next door to Uma by COMO, and is said to be the most comprehensive collection of traditional and modern Balinese paintings on the island. Entry costs £4, and the collection includes 6 pavilions covering Balinese painting from the 17th century onwards, as well as European and American artists and photographers who have lived and painted in Bali, and had an influence on local artists. It is well worth an hour's visit. We flew to Denpasar, Bali via Singapore, for around £630 with Singapore Airlines. Several Gulf airlines offer return flights from the UK at similar prices. Villa rooms at Uma by COMO cost from £140 to £268 per night. For more information, visit their website on www.uma.como.bz. Uma by COMO's three-hour tours with chauffeur, guide and cycling cost £70 per person. The featured Umabona Room on the Shambala Estate is priced at $3,200 per night, for two bedrooms with up to four people sharing, or $4,300 for two nights as part of a 'vitality ' package. For more information, visit the website. Haven't been to Indonesia for far too long. Oh wow! I very much enjoy reading about your travel in Bali. I am hoping to visit Bali whilst in Indonesia, before flying back to the UK. Currently spending time with family in North Sumatra. I've always wanted to try Mozaic... the food looks amazing! I must check out the hotels too. Last time I went to Bali, I stayed at Kuta area. It'll be nice to stay at Ubud. I wonder if that Royal Suite is available... lol. Heading to part 2 now. thanks for sharing such a lovely article on traveling and showing some exclusive traditional pictures..photos are really amazing..you have a good eye for taking picture. Wow! delicious food pictures, really lovely picture..after watching the pictures i wish to taste this food..yummy delicious foods,Thanks for sharing this wonderful article on traveling, wow! you shared some exclusive historical picture,,these are really brilliant. Thanks for sharing this tour guide with us, I really glad to read your personal tour experience that you have shared with us, Great guide keeps sharing.